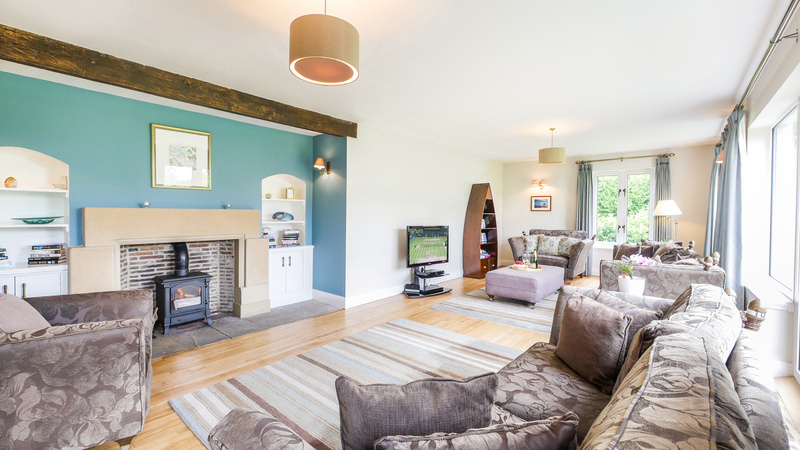 One of the most popular cottages in our collection, Lyndhurst near Alnmouth is a fabulous large and luxury holiday home. 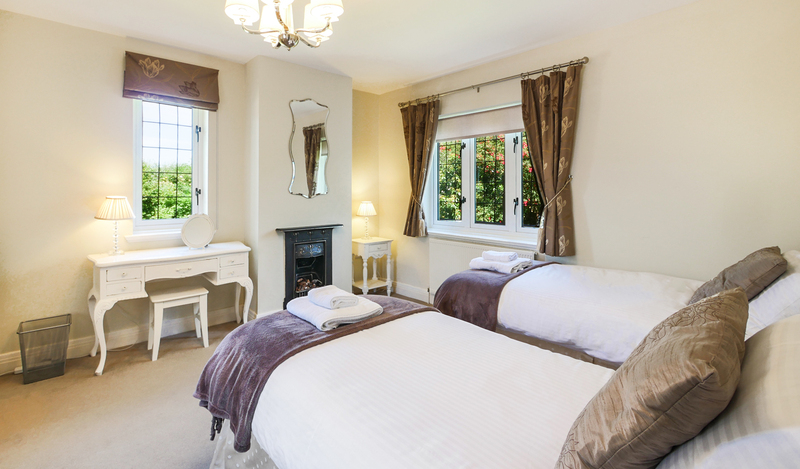 Awarded 5 stars and a coveted GOLD AWARD by Visit England, Lyndhurst is situated in the charming hamlet of Foxton, on the edge of the seaside village of Alnmouth. Incredibly spacious, this beautiful coastal home has an ideal layout for either several couples or a large family to holiday together. Single beds are convertible to doubles and there are 4 bathrooms and 5 bedrooms, which are laid out in such a way that each has privacy and space away from the others. 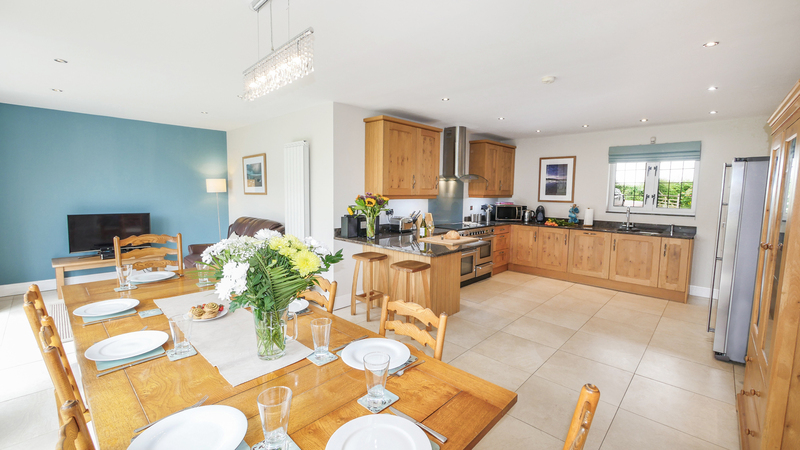 Sleeping up to 8 adults and 2 children very comfortably, and pet friendly, this is the perfect cottage for larger family gatherings, two or more families to holiday together or a simply a luxurious retreat for 2 or more people. Furnished and equipped to a very high standard with superb attention to detail, this beautiful cottage has a lovely view of the sea, over the greens of the Foxton Golf Club golf course which looks out to Alnmouth and Foxton bay. 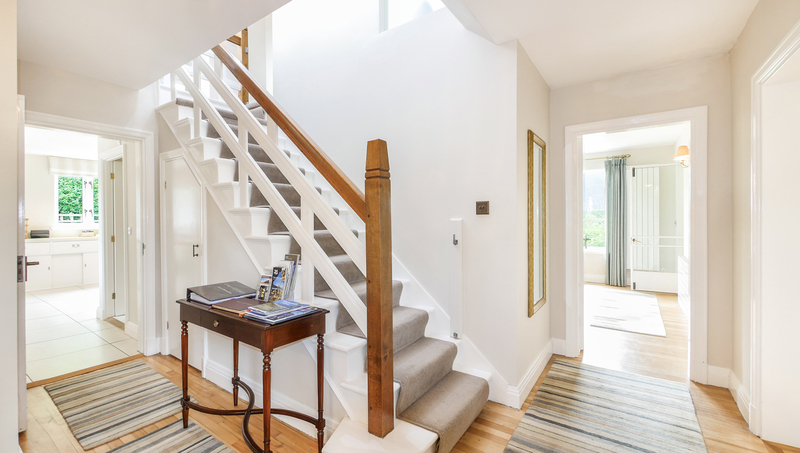 The front entrance leads into a spacious hallway with original period staircase and access to all ground floor rooms. There is a telephone accepting incoming calls and outgoing calls to emergency and freephone no’s only. Large living room with inglenook fireplace and wood burning stove – unlimited supply of logs provided all year round. Comfortable luxury sofas. Several large windows overlook a very attractive south-facing garden with French windows opening out onto a large, furnished patio. Free Wi-Fi broadband internet access throughout the cottage. Large flat screen digital TV with DVD player and BT Vision Unlimited, featuring BT Sport and Netflix. Spacious and well equipped kitchen in solid ‘Pippy Oak’ with granite work tops and stainless steel appliances. All the usual appliances; large American style fridge freezer, range style electric oven with ceramic hob, dishwasher, toaster and kettle. A Nescafé Dolce Gusto coffee machine is provided with a small selection of drinks pods. Further pods are available at Sainsburys and Morrisons in Alnwick. 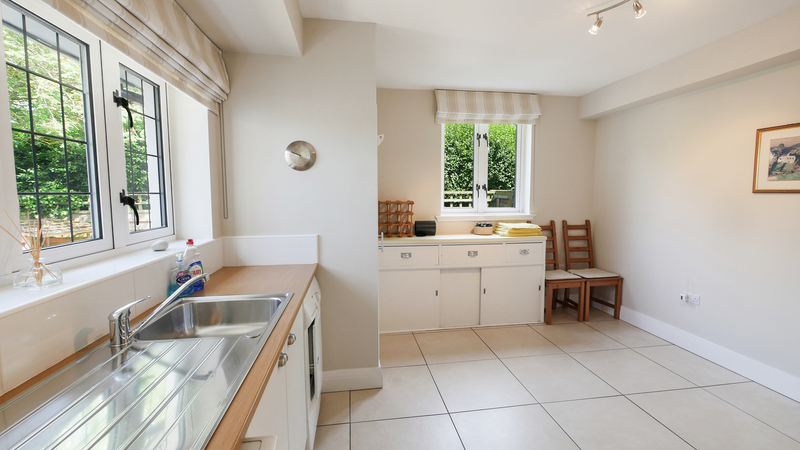 Spacious and open plan to the large dining area, with a leather sofa and flat screen TV, this is the perfect kitchen for cooking and socialising with friends and family. Hi-Fi with mp3/iPod connection. Open plan from the kitchen with a glazed door leading through to the lounge, this spacious, light and airy room provides the perfect relaxing or entertaining space. The dining table seats up to 10 and there is a leather sofa and large flat screen digital TV, which provides an additional lounge area. XBox 360 with Kinect and games available. Two sets of French windows provide masses of light and a lovely view of the south-facing garden and golf course beyond. In the warmer months, the French windows can be fully opened, providing a wonderful open space, blurring the boundary between outside and in. A very useful and spacious room easily accessible directly from the front door and hallway, with washing machine, tumble dryer and sink. This room is perfect for dogs to sleep in as it’s warm whilst being separate from the main living areas. 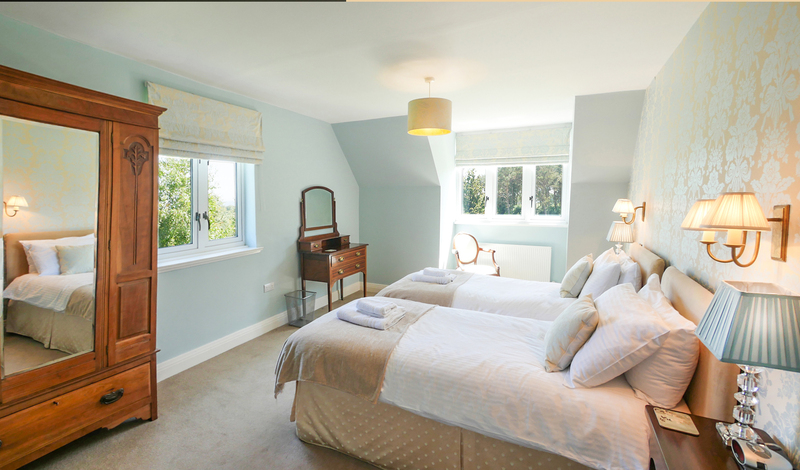 A lovely, spacious room overlooking the front garden, with twin single beds which are convertible to a superking size double bed upon request (£10 extra charge). Large flat screen TV with digital channels. This room is ideal for less mobile guests, as there is an adjacent washroom with WC and wash hand basin, and separate shower room with a double sized, level-access walk-in shower. Shower room with double sized, walk-in shower. A magnificent master bedroom with kingsize bed. En suite bathroom with large bath, sink, WC and walk-in shower cubicle. Beautiful garden view. Large and truly luxurious en suite bathroom, with an extra large bath, double walk in shower, wash hand basin and WC. Although still on the first floor, this bedroom is quite separate from the others and is accessed by its own private staircase. It has the benefit of a large en-suite wet room, with shower, WC and wash hand basin. With a kingsize double bed and a lovely view of the golf course and coastline through windows on 2 elevations, this room provides a quiet and private space for a couple. Full size bunk beds provide a fun bedroom for one or two children (maximum age 12rs). Lovely view of the gardens and the sea beyond. A large ‘house bathroom’ with a deep plunge bath, WC, wash hand basin, double-sized walk in shower with feature, adjustable drench shower. Beautiful south-facing view of the gardens, golf course and sea beyond. Lyndhurst is a stunning Arts and Crafts inspired holiday cottage for large families or groups of friends, next to the sea, full of original features and with a touch of luxury. Lyndhurst is a very impressive property, with huge lawned gardens to enjoy when the sun shines! This pretty room has the original fireplace still in place and is usually made up as twin single beds. They can be made into a super king size for a small charge. 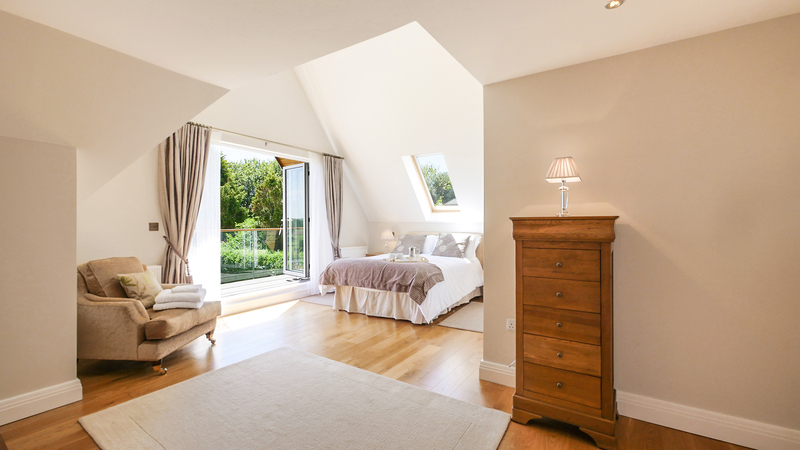 The master bedroom is stunning, with bi-fold doors that open to look out across the well-manicured garden, over the links golf course and out to sea. Master Bedroom. Look at that view! Admire the amazing position of Lyndhurst from above! Lyndhurst is located just out of this shot, to the left, overlooking the greens of the golf club which is in the centre of this image, just next to the beach. Lyndhurst is just a couple of hundred yards easy walk to the lovely beach and the golf club is open to non-members for lunch and drinks. Up to 8 adults, 2 children and 2 babies welcome. Luxury Welcome Hamper including White Company Toiletries and bespoke Property and Area guide, unlimited supply of logs provided all year round and free Wi-fi. Two babies welcome. A stair gate, 2 travel cots and 2 highchairs available upon request. Three well-behaved dogs are welcome. £20 charge for each dog, per holiday. Booking Conditions apply and see more details on our Dogs page. Dogs are not permitted to be left in the house unattended. Dog sitting service available, contact us to request. To the front of the house is a large private driveway suitable for up to 4 cars, a lawned area with trees and shrubs. 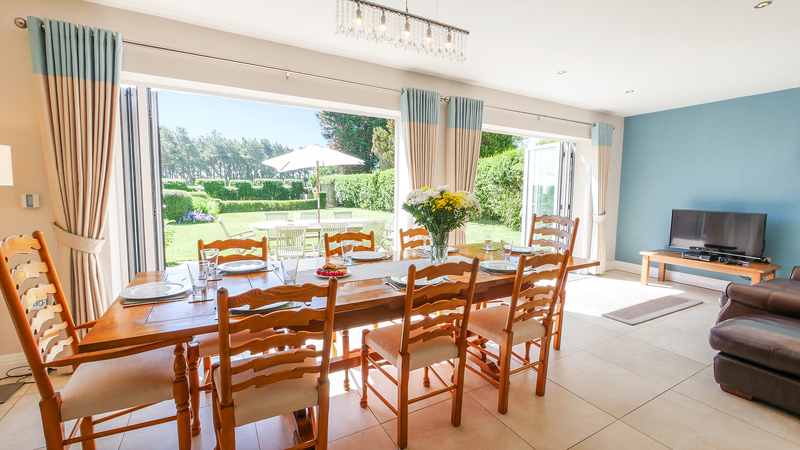 To the rear there is a large lawned garden with a spacious south-facing patio, furnished with a large table and chairs, and a vegetable patch overlooking the links golf course and coastline beyond. The sandy beach is just 5 minutes’ walk from the cottage. There is a BBQ provided at Lyndhurst which is available all year round. There are also utensils provided for cooking with. We kindly ask you bring your own charcoal. Please ensure the BBQ is cleaned prior to your departure. Private, gated parking is available for up to 4 cars. Accommodation on 2 floors. On the ground floor, there is the lounge, open plan kitchen and dining room, utility room, ground floor bedroom and shower room. On the first floor there are the remaining 4 bedrooms and family bathroom. One of the bedrooms is located up a separate stair case. 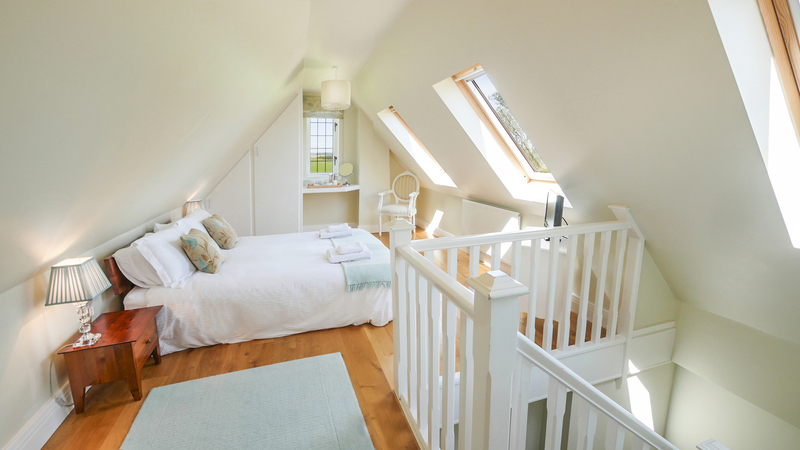 The bedroom on the ground floor is suitable for less mobile guests, with level access. 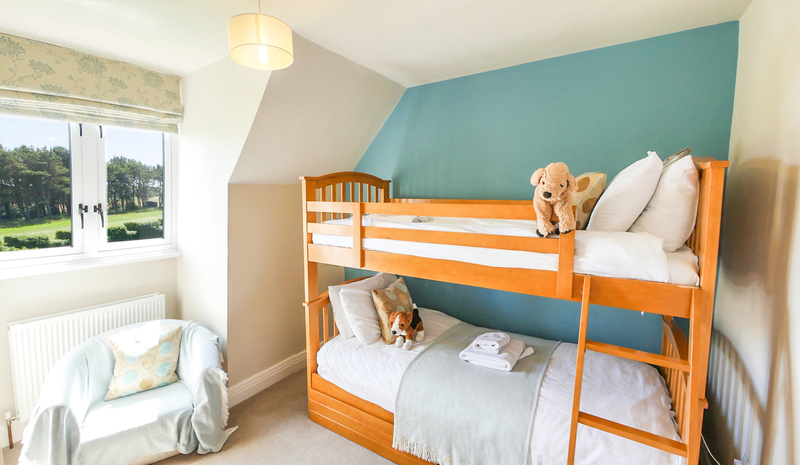 5 bedrooms; 2 king size rooms with 5ft wide beds; 2 twin bedrooms (one on the ground floor) with single beds (3ft wide) that can be converted into a super king (6ft wide) for a small charge; 1 bunk bed room with single size beds (3ft wide) strictly for children. The duvets and pillows provided are a mix of synthetic and feathered in each bedroom. There is no alternative available. 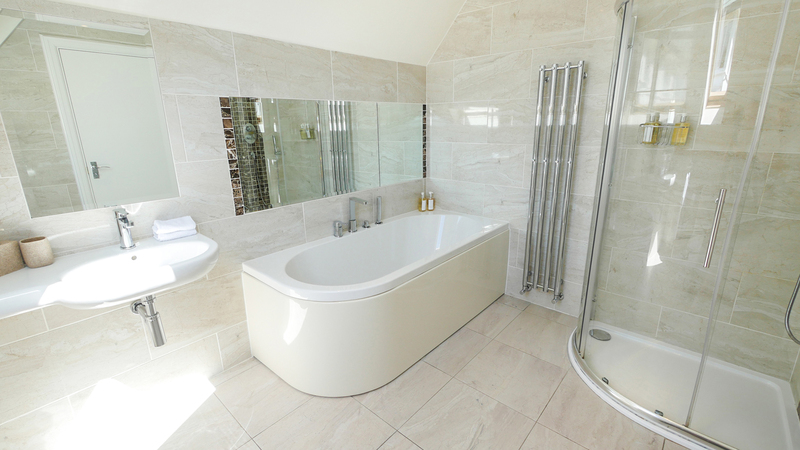 One family bathroom with a large bath, separate large walk-in shower, WC and basin with heated towel rail. 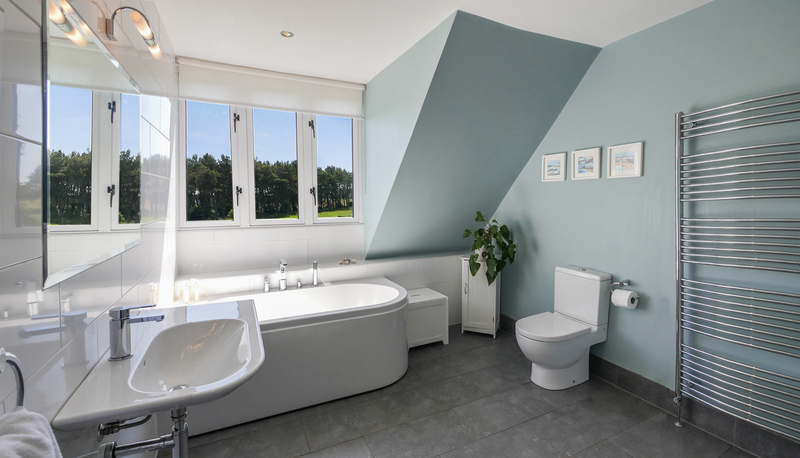 There are 2 en suite bathrooms; the master bedroom en suite has a bath, separate shower, WC and basin; the 3rd bedroom has an en-suite wet room and the ground floor bedroom has a separate shower room with a double-size walk-in shower and wash hand basin. Separate WC on the ground floor. American-style fridge/freezer, range-style electric oven and ceramic hob, dishwasher, microwave, toaster and kettle. Washing machine, tumble dryer, iron, ironing board and vacuum. Nescafe Dolce Gusto coffee machine with small selection of pods provided. Hairdryers, books, music and films. Secure bike storage. Cot linen available to hire for a small charge. Wood-burning stove – unlimited supply of logs provided all year round. Free Wi-Fi. BBQ and vegetable patch. TV’s in the lounge and ground floor bedroom, with Freeview and DVD players and the addition in the lounge of BT Vision Unlimited, featuring BT Sport 1 & 2 and ESPN, TV on Demand, Catch Up TV, Pause, Rewind and Record TV and Vision Films, Kids and Music. Hi-fi with mp3/iPod connection. Radio and Music System and XBox 360 with Kinect and games. Free unlimited Wi-fi. Play our amazing video below of Lyndhurst to see the beautiful location of this stunning coastal home! 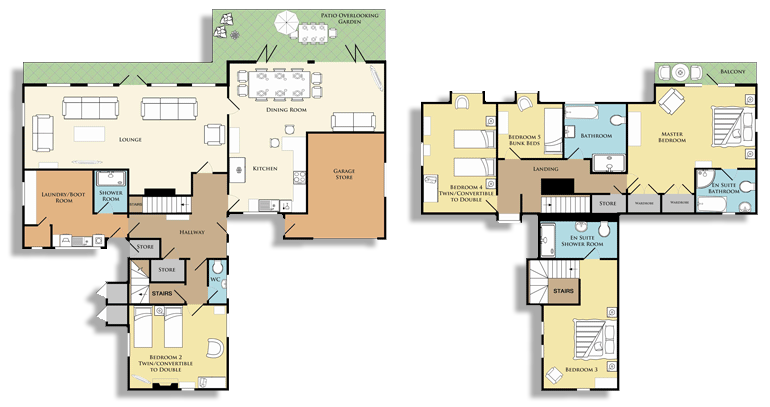 Here is a floor plan of Lyndhurst, it’s not perfectly to scale and may not contain every minor detail, but is provided to give you an idea of the layout. Click on it to enlarge. If you have any queries, email us, call us on 01665 710 700 or contact us via our livechat facility. 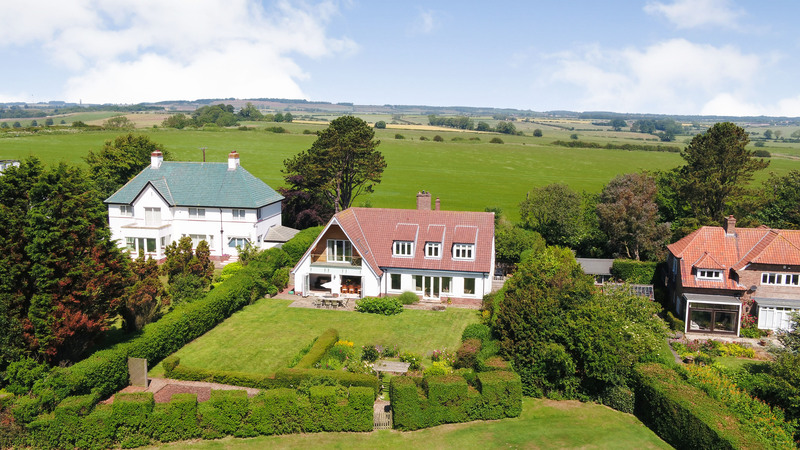 Lyndhurst sits in the gorgeous little hamlet of Foxton, just outside Alnmouth. It looks out onto the highly regarded 18 hole Alnmouth Golf Club which is highly regarded as one of the best golf courses in the UK. It’s open to non-members and also has a pleasant restaurant that serves a good Sunday lunch. Alnmouth is an exceptionally pretty coastal village with a great range of places to eat and drink and quirky shops. Alnmouth beach is a beautiful sandy beach which is dog friendly all year round and just a short, 5 minute pleasant walk from Lyndhurst. Alnwick is just 10 minutes north, where there are numerous fine restaurants, the world-famous book store ‘Barter Books’, Alnwick Castle and the world class attraction of Alnwick Garden and Treehouse. The delightful village of Warkworth is just 4 miles south of Alnmouth, where there is a good range of pubs, restaurants, cafes, lovely quirky shops and art galleries. The magnificent castle is fascinating to explore and there are lovely riverside walks, where the River Coquet encircles the village before meandering out to sea. To find out the distance of Lyndhurst from your own home, how long it will take to drive there and other options for alternative transport, click here: Lyndhurst on Googlemaps and enter your home postcode. The postcode for Lyndhurst is NE66 3BD. Coquet Cottages and the owners of Lyndhurst, Mike and Liz were fantastic. To tick all of our boxes was a tough call but Lyndhurst did just that! Thanks again to all concerned, I’m sure we will find another excuse of a celebration to return sometime. Head into Alnmouth Village to The Old School Gallery and view the stunning exhibitions of local artists, have a browse around the gift shop, and relax with a tea or Illy coffee and slice of cake in the cosy cafe. Have a chilled day on Alnmouth Beach. Take a picnic hamper, flask of tea, bucket and spade and kite and enjoy a traditional seaside afternoon on the stunning Northumberland coastline. Head up to Barter Books in Alnwick (about 3 1/2 miles from the cottage) which is an old Victorian train station converted into the most fabulous bookstore, about 10 minutes’ walk from the cottage. Every book you can imagine is here, even some very valuable first additions on display. They have a lovely café converted from the old waiting rooms in the station if you wanted a nibble and something hot to drink. As the name suggests, you can bring old books into Barter Books and exchange them for credits so you can buy something new (or old!) to take home. Pick a good book and get settled in front of one of their many open fires. Dogs and snoozing welcome!